Our piano lesson program is set up to include instruction for beginning to advanced students - accommodating children as young as six years. Students should have 30 minutes each day to devote to practice. Piano lessons are given on site at Jamestown Piano Shop. 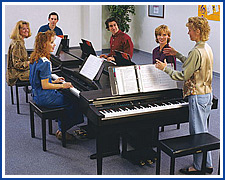 Our music instructors are experienced and well trained. For more information please fill in the form below as completely as possible and we will get in touch with you. Thanks!